So that's basically how I'm feeling about that ending right. I almost cried. I had to put the book down and walk away so that I could get my feelings under control. I went into this book with high hopes and I wasn't disappointed. I loved Wonderland in this story. It was creepy and filled with puzzles. The way everything was described was so detailed that I could imagine exactly what characters looked like and what Wonderland looked like. The thing that really made me love this book was the fact that I didn't know how it was going to end. I never predicted the twists and character's motives. 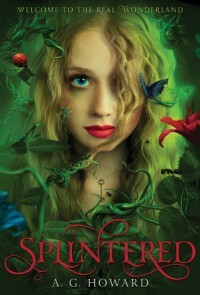 Normally I can figure out what's going to happen before the character does but not in Splintered. I love it when books can surprise me like that. I loved the Wonderland characters especially Morpheus. He was definitely my favorite character because he was just so interesting and it was never quite clear what he was thinking. I never would have guessed what his motives were. Throughout most of the book I liked Alyssa. In the beginning she just let herself be saved by Jeb or whoever else happened to be around. She didn't really have control over anything that happened to her but by the end she really grew as a character. She was able to stand up for herself and actually defend herself without Jeb's help. Honestly the only reason I didn't give this book five stars was because of Jeb. He bugged me to no end. He couldn't seen that Alyssa was perfectly capable of making decisions without him and that he didn't need to protect her like she was a child. Going into this book I knew that there was a love triangle. I was ready for the inevitable. When it finally happened I was surprised by how much it didn't bother me. It was obvious who Alyssa would choose in the end so it didn't really feel like the typical love triangle. The ending left me kind of unsatisfied and it will probably stick with me for a few days. Other than that and Jeb this book was amazing and I would definitely recommend this to anyone who likes fairytale retellings.